While it is true that radio has stiff competition in television and other entertainment sources, it is still a great way to kill boredom when you are working or are forced to wait for a while before getting on your way (e.g. flight delays, doctor appointments, …). 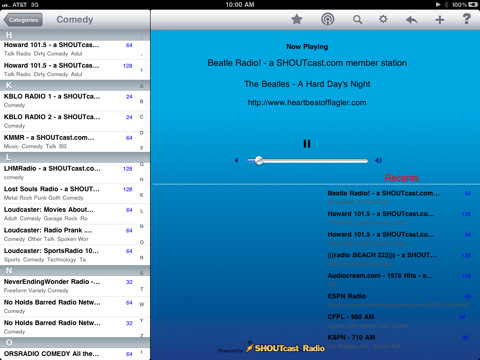 Radio for iPad brings thousands of radio stations to your tablet. You won’t need a separate radio to take advantage of all these channels. Radio for iPad offers you access to 40,000+ channels. It has a decent search functionality to make going through all these channels easier. Shoutcast radio is integrated into this app, which is a big plus. Your favorite radio channels can be played in the background. The app is Twitter and Facebook friendly as well. 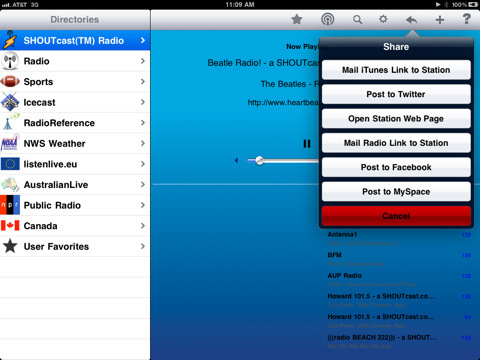 Radio for iPad is quite flexible and lets users add new directories and stations to it. Weather and emergency channels included in this application are very nice. Like a new station you have found? You can share its link with your friends. Mp3, AAC, PLS, M3U, and XSPF files are supported too. Who needs a physical radio when you can rely on Radio for iPad to listen to as much content you can handle on the go.